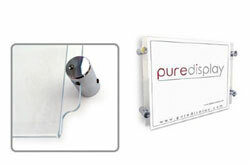 Uses easy access poster holders, such as the ones in cable display sets, for direct wall fixed display allowing easy access to change posters frequently. Each set includes 4x 5/9 inch polished chrome wall mounted grips. Paper Size: US Letter Landscape - 11 inch (w), 8½ inch (h).